A man had just got off the coach at La Roche de Rame. Before going to his relatives house, he stopped at the cafe for breakfast. on the other side of my skin ? In a small cafe of the « Quartiers Nord », a man was watching the trucks go by in the rain. Then he dismissed his thoughts. He said: « At that time, I had nothing to say. That was something I cultivated ». But his eyes are undecided. Two friends met in a little tourist port. The end of the season had made it more sober. On the glittering green water, lined up with the jetties, each brightly-colored boat had the purity of a concept. His friend looked at him, trying to revive their common memories, but couldn't manage it. Through the window of his villa, a man stared into his garden. at the fall of day. Her sentence made him shiver. In the space of a few minutes, the impression of that place engraved itself so strongly on him, that he kept its scar for a long time. Once, on the highway from Marseilles to Aix, a man noticed a factory on his right. is merging into the clouds. A hundred years before, on arriving here, Van Gogh had found something of Japan in the region. That gave a group of friends the idea of writing in the manner of the haïkaï renga. The morning shift would soon begin their work in the shipyards of l'Estaque. He saw her in order to dream. However he didn't dream of anything specific. Her windows looked over the sea. A man had spent the night at the house of a lady friend who lived on the coast. Early in the morning, he went down towards the beach to buy some tobacco. His lady friend was eating when he came back. There was a little coffee left for him on the stove. That sleep has left me. Could seem to be dreaming. That it keeps you awake. He left to have coffee under the arbour. The weather was exceptionally fine for the season. While leaving L'Argentierre, a man took a final glance at the banks of the Durance. In the city dump, rubbish was burning. drowned by the rain ? Over the highway to Salon, day was falling. It had snowed, and the vehicles were moving slowly. In the car, the cramped occupants were talking about the purpose of their journey. But I have the impression that it's late. This impression was much stronger than her words translated. Something was distilling a feverish haste in each of them. He wrote this on a page of his pad, then crumpled it. It often happened that she would write a few lines as soon as she had opened the shutters. and you glimpse the sea-bed. A man was walking in the Parc Borelly in Marseilles. It was a warm September afternoon, and he wanted to find quiet and coolness in the proximity of the lake. The woman who was looking at him hurriedly turned her eyes away. He also involuntarily looked away. This reaction made him smile, like the sharp and profound feeling it awakened in him. Than to tray to tame it. Their ears were still so full of the sound that the car seemed noiseless. The first light of dawn, the cool air, and the strong smell of day strengthened in their mouths the taste of over-smoked tobacco, and, on their skin, that feverish moisture of lake of sleep. And dreams feed on reality. A young couple was talking sitting at the terrace of a bar. They had undoubtedly forgotten the world. Moreover, that day, the world itself could be forgotten. The cloudy sky extinguished every vestige of color on the desert square. Their words were like powerful hands, clutching clumsily. To sacrifice everything for you! To sacrifice is one thing. But what about giving ? To me, What would you give to me ? Literary publications left him with a curious impression. As if the reviews had been finely sliced plates of literature. On being consumed, the many tastes fused together. And, from a distance, the plates themselves merged into a great mosaic. He would have liked to decipher the pattern they were drawing. It only seemed to have been agreed that they would contain something, a style, a taste: something which, if you could possess it, known it, would mean you were no longer a complete stranger to the world which produced it. Was this only an impression ? When he awoke, the sky was very pure and clear. Only little white clouds were left, which the wind from the Alps drove away toward the sea. 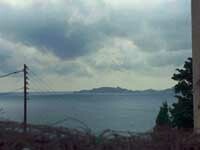 The day before, a contrary wind had carried rain clouds toward lands. His morning was taken up writing post-cards. He had just received from a friend a long disjointed letter telling him about life of the spirit. And so he read Aristotle's « Psychology », in which he looked for inspiration for his little abstract pencil drawings. He said that « Psychology » was not a good translation for « Pery psyche » ; he preferred « On life ». The next day, the wind having fallen, he left for the beach, taking with him « The Meteorologica ». He expected from it some sublime remarks about rain and fine weather. For many people, February is a hard time of the year. Already weary of winter, its end isn't yet in sight. That day, he didn't get up for work. It was late when he went out to get some cigarettes, and his first cup of coffee, facing the sea. Through the glass he saw that the sun was already very high. He discovered at the same time that winter was not far from ending, and that the fatigue he had felt invading his limbs that morning was actually an intense desire to be lazy. 19 Contes du Sud-Est by l'Atelier d'Endoume, with lithographies of Georges Point. The tale 117 has been published in French Action Poétique. All the others tales are unpublished.